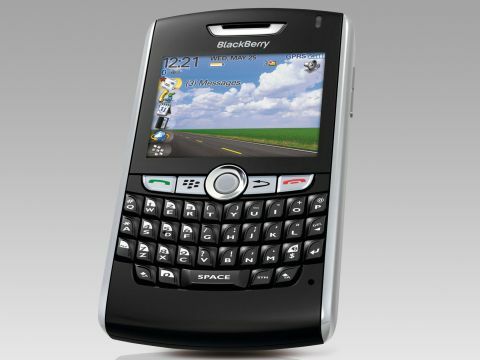 RIM's (Research In Motion) BlackBerry has become the world's most popular handheld, its excellent usability and Qwerty keypad setting a trend many rivals have followed. The BlackBerry 8800 (free with a Vodafone contract) has all the usability of its predecessors, but has replaced the stuffy design with styling similar to the consumer-focused BlackBerry Pearl. Along with the glossy finish and slim 14mm deep casing, it also uses a roller-ball for navigation. We found this precise, ergonomic and an ideal way of navigating the screen. Because the ball itself is not attached, it's less prone to wear and tear. Above this sits a 2.5-inch screen fitted in a landscape orientation, which is ideal for viewing webpages and documents. In the daylight, it's a vibrant and bright display. A sensor automatically dims it in darker conditions, making it less distracting and improving battery life. This is another area where the 8800 excels, as with basic use we easily managed to get over a week between charges. One thing that continues to set the BlackBerry apart is the excellent keypad. Despite many imitations, this still remains the best choice. RIM has given the keys tapered edges, which helps to ensure typing mistakes are kept to a minimum - even when writing rapidly. It also means creating an email is not the hassle it is on other devices, highlighting why the BlackBerry is such a popular handset. This usability doesn't stop at the hardware itself. Setting it up as an out-of-office device is easy - to receive your emails simply log on to the BlackBerry website and enter your email address and password. Push email capabilities mean you receive emails without having to download them from a central server. If you do encounter trouble with your account, there's a set-up wizard to help you out. You can even configure up to ten email accounts. Its talents as a corporate device go far wider than just email, as it's possible to download an office suite, so you'll even be able to work on documents as you travel. Although Bluetooth is built in, Wi-Fi isn't, so you won't be able to connect to company networks. RIM has fitted a GPS module in the 8800, which is unusual for a device of this size. It has also included software called BlackBerry Maps, which let you use it as a navigation device. After using the BlackBerry 8800 for a couple of months, it will be difficult to find a replacement. Apart from the lack of Wi-Fi, it's virtually impossible to pick fault with this device.